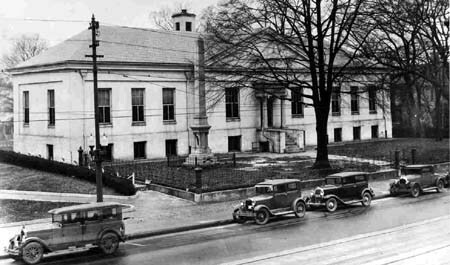 On December 4, 1837, a branch of the United States Mint opened in Charlotte. The North Carolina Department of Natural & Cultural Resources blog. Article on the need for a mint in North Carolina due to the local gold rush. The first documented discovery of gold in the United States was in 1799 at John Reed's farm in Cabarrus County, NC. John Reed’s son, Conrad, found a 17-pound gold nugget while fishing in Little Meadow Creek. This discovery started the first gold rush in the nation's history. In 1825, Matthias Tobias Barringer found gold imbedded in a quartz vein on his property in Montgomery County (later Stanly County). Until that time, placer mining of surface areas for gold by panning or use of rockers had been the method for gold extraction in North Carolina. The Barringer Gold Mine signaled the beginning of lode mining in North Carolina, which led to a larger gold rush into the state. North Carolina led the nation in gold production until the California Gold Rush of 1849. The majority of the gold deposits and the most productive gold mines in North Carolina were located in the gold-bearing "Carolina Belt." The "Carolina slate belt," located in the central Piedmont, includes Mecklenburg, Cabarrus, Rowan, Davidson, Guilford, Stanly, Montgomery, Randolph, Moore, and Union Counties. Gold deposits also occurred in the Blue Ridge area of Burke and Transylvania Counties. According to North Carolina Department of Environmental Quality, "Most federal lands in North Carolina are in parks and forests. Although prospecting is not permitted in national parks, prospecting or exploration permits are occasionally granted in national forests. The district forest ranger should be contacted for permits and regulations. Prospecting is not allowed in state-owned parks or forests." "Some visitors to the national forest like to try their hands at finding minerals or panning for gold. Visitors are asked to follow these guidelines when rockhounding or gold panning in the National Forests in North Carolina."